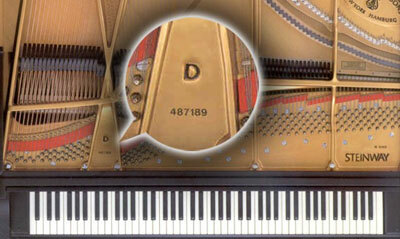 To determine the age of a Steinway piano, we need to first locate the serial number. 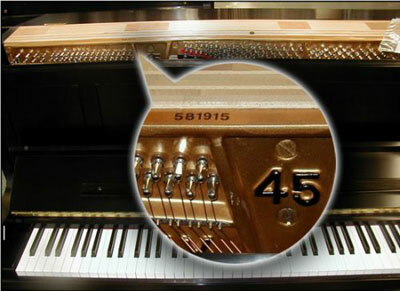 On Steinway grand pianos, the serial number can be found on the cast iron plate between the tuning pins above the keyboard. On Steinway upright pianos, the serial number can be located on top of the wrest plank above the cast iron plate when you open the lid. For the cost of $25USD (to help defray the costs associated with providing this service), Steinway & Sons will provide the history on any Steinway piano based on the serial number of that piano. Submit your request using the secure form below and within 1-2 weeks (U.S./Canada, slightly longer for international mailing) you will receive by mail the following information on Steinway letterhead: Model, finish, length, weight, date and place of manufacture, to which dealer it was sold and when. If we have any additional information, such as restoration work or if your piano has an art deco case, that will be provided as well. If an insurance letter is requested you will receive a letter stating the insurance replacement value of your piano. If you have any questions, please contact the Steinway Factory at 718-204-3113.